Maddie Bradshaw has always been a bit of an overachiever. The 13-year-old is a straight-A student, plays three sports a year, and has a passion for art. So it's perhaps not all that surprising that she would eventually add "entrepreneur" to the list. When Bradshaw had trouble finding fun decorations for her middle-school locker, she took it upon herself to design something from scratch. Her inspiration came from an unlikely source. "My family's really into recycling," Bradshaw says. "So I went to my uncle's old-fashioned soda machine and found a bucket full of caps, and knew that I would need something magnetic so I took one." Bradshaw sketched a black and white abstract portrait of Albert Einstein, one of her inspirations, inside the cap. She put it in her locker and her friends quickly begged her to design more for their lockers. Bradshaw returned to the bucket of caps and designed a "Birthday Girl" cap for her sister as well as others for her friends. She decided the caps also would make fun jewelry. Taking a piece of string and knotting it around her neck, she created a necklace with interchangeable charms. 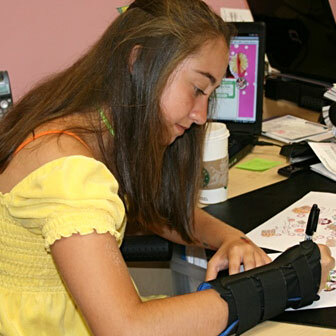 "A kid knows what a kid likes," says Bradshaw, who took her bottle cap idea, which she named Snap Caps, and pitched it to a local toy store, Learning Express, in 2007. Selling out of the 50 bottle caps Bradshaw and her mom took to the store -- in under two hours -- Learning Express quickly asked the then-10-year-old if it could carry the Snap Caps in more of its stores throughout Texas. Now, Bradshaw's designs can be found in hundreds of stores throughout the United States, Canada, and the Bahamas. Snap Caps can be worn on necklaces, in hairpins, or as bracelets. "All my designs are interchangeable," says Bradshaw, whose company now sells 50,000 necklaces and caps every month. As the founder, president, and head designer of the Dallas-based company, Bradshaw is still a full-time student and plays lacrosse, tennis, and is a member of the swim team. Her 9-year-old sister Margot helps design and paint some of the bottle caps, and is most often the person Bradshaw turns to for advice. "She always knows what the latest trends are, what my friends and hers are going to like," Bradshaw says. Margot also serves as the company's vice president, while mother Diane is CEO and the person who is responsible for all the financials. "Maddie definitely attends the business meetings, talks about the designs, and goes to trade shows," Diane Bradshaw says. Maddie's accidental product has become something of a tween-selling powerhouse -- Snap Caps were featured at the Teen Choice Awards and now bring in $1.6 million in revenue. Throughout this summer, Bradshaw has worked with the company's 25 employees, designing more caps and expanding into hair ties and notebooks. "I'm glad I started this company as a kid," Bradshaw says. "I've learned how to market a business -- and I think it's really fun."